People have been asking us for years to put a wire into our threads so that they can form stand-out embellishments on their needlework. We created Hot-Wire™, a wired version of our Medium #16 Braid metallic, and have enjoyed seeing the creative way it is used in cross stitch, needlepoint, and quilting. In January, we partnered with the design company JulieMar to create custom Hot-Wire colors for one of their new canvases. Read on to hear how designer Patricia Dee of JulieMar used the unique fiber. Q: Tell us how you got into the needlework business. A: I’ve been doing various needle arts since I was a child. About 8 years ago I quit my full time job and started stitching with a vengeance. 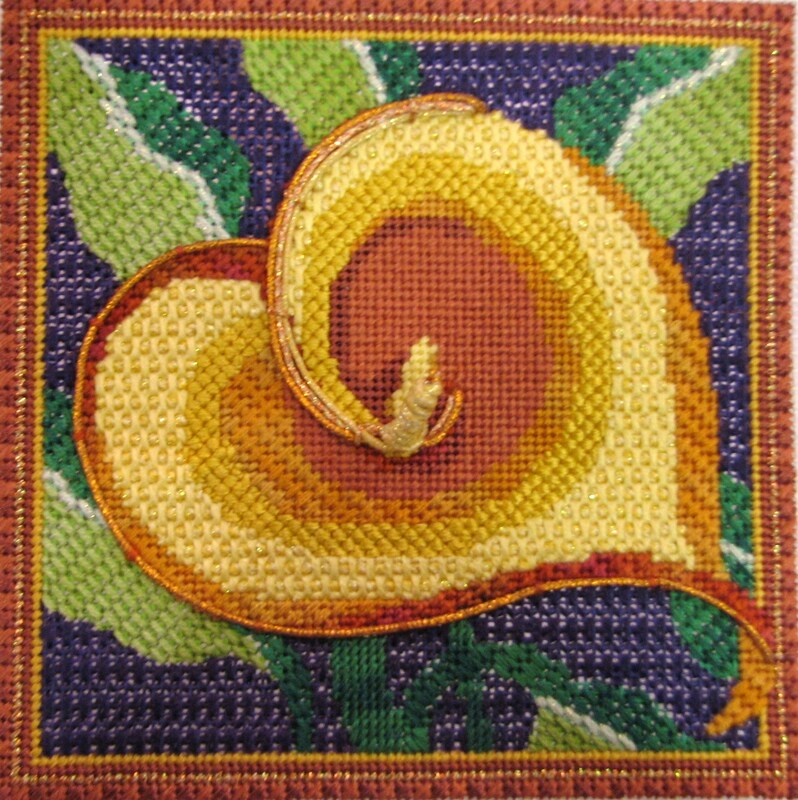 I was drawn to the plethora of fibers and stitching techniques available with Needlepoint, so that became my focus. In the fall of 2008 I purchased the JulieMar wholesale line and began designing my own canvases. Q: We love the bright colors of your new Cala Lily canvas. What was the inspiration? 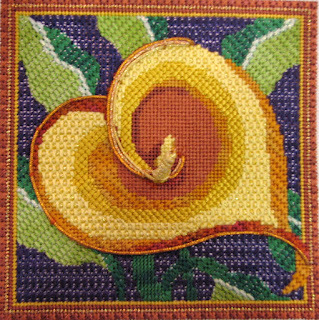 A: This particular design, a Single Cala Lily in 4 different color ways (JulieMar #2112 – 2115), was inspired by my love to use different stitches and fibers. 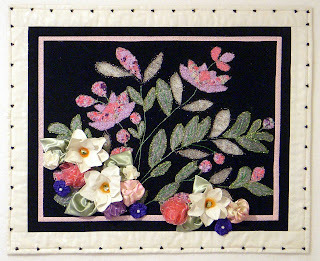 Although beautiful, Julie’s traditional florals do not lend themselves to use of many stitches. I wanted a flower that would allow the stitcher to experiment with techniques and fiber. I also like 3 dimensional designs, so use of Wired Braid™ became essential to the design. The curve in the flower was perfect for wrapping the Wired Braid™ fiber, so that became my focus. Q: How did you use the wired Kreinik thread, Wired Braid™? A: In this piece, Kreinik Wired Braid™ fiber was used in 2 different ways. First, I wrapped the fiber, three different colors, around the curve of the flower. This ads dimension and emphasis. The quality and shine of the fiber also add elegance to the piece. Secondly, I used the fiber as a part of my finishing, rather than ribbon or braid. I used the 3 colors utilized in the piece, doubled them & braided them into a fishtail braid. This can also be made wider by using 3 strands of each color. Q: Any tips or suggestions for stitchers wanting to try the wired metallic? A: The key to using Kreinik Wired Braid™ is using a needle with a large eye. Use the blunt end of the needle, or a laying tool to widen the space between the stitches where placing the fiber. If possible, come from the top towards the bottom. If you’re having problems threading, trim a tiny piece and try again. Also, stitch the canvas underneath the Wired Braid™, preferably in a cotton or silk fiber. This will add height to the wired thread. 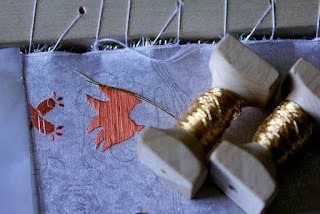 Q: Any other creative ideas for using the thread for needlepoint embellishments? A: Kreinik Wired Braid™ can be used anytime you want to add dimension to a canvas. Outline the focal point, use it in the border, or add dimension to the inside of a flower (replace bullion stitches by wrapping the Wired Braid™ around a pencil for a curly spiral. I am also using it to create jewelry. I’m currently stitching one of my “Elegant Ladies”, Audrey’s Haut Couture, JulieMar #1004. Audrey has a beautiful comb in her hair, so I’m designing the comb out of the Wired Braid™ fibers. Again, I’m stitching the area in a basket weave using a similar colored fiber first. The Wired Braid™ jewelry goes on top to give it a three-dimensional look. A few years ago when Hardanger was at a peak of popularity, Kreinik was asked to design a thin silk fiber for woven bars, picots, and other very fine, detailed stitching. We created Kreinik Silk Bella, now available in about 40 colors. Aside from Hardanger, this strong, pure filament silk is used in stitching over one on fine counts of linen, for punchneedle, beading, and crazy quilting. To use Kreinik Silk Bella in your own projects, simply choose one or more of the beautiful colors available, then use it straight off the reel. Do not separate it — just cut a length and start stitching. This thread is suitable for any stitch, any skill level, any fabric. Make sure you are using a needle with an eye large enough to accommodate the thread and the fabric density; this will reduce any abrasion on the thread. To find Kreinik Silk Bella near you, visit the Store Locator on www.kreinik.com, ask for it at your local needlework store, or visit www.kreinikmall.com. This sensational quilt – "Sensational Flowers" by Rita Lynne of Almost Heaven designs — will be featured in the Kreinik booth at Spring Quilt Market this month. If you are a shop owner or designer attending the show, be sure to stop by and check out the unique techniques used on the quilt. 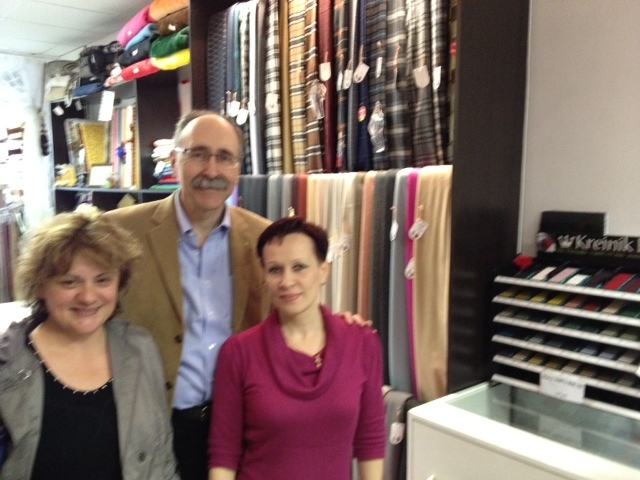 We must say, the Kreinik threads look fabulous! Rita used Kreinik Micro Ice Chenille, Fashion Twist, Fine Twist, Medium #16 Braid iron-on, and Very Fine #4 Braid. We will be selling a thread kit and the pattern. I just got back from Russia. 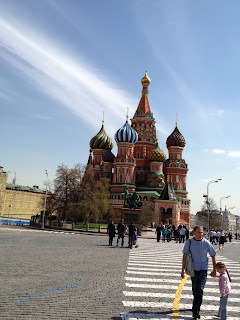 Wow, I saw the Kremlin, the traffic, ate great food and had a couple of shots of the Russian national drink (Vodka). I saw “Big Mac” and “Burger King” written in Cyrillic. I saw two guys made up to look like Stalin and Lenin sitting outside the Kremlin, saw the largest bell in the world and, again saw lots of traffic. 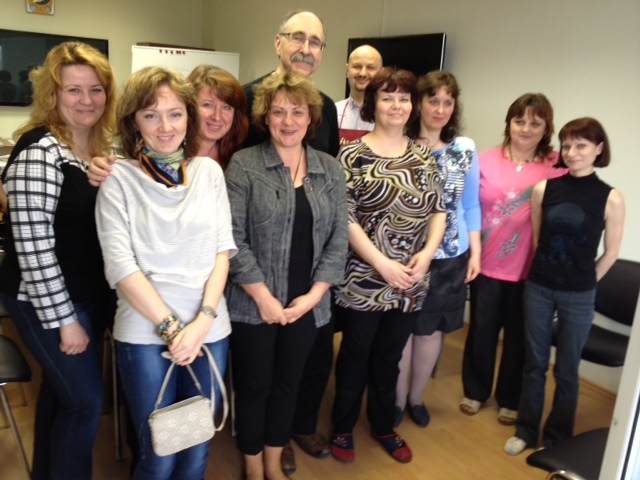 My distributor in Russia had invited me to come and give classes to shop owners and staff at her facility in Moscow. We created a complete, colorful, photo-packed Power Point presentation for me to use, and I tried it, I really did, but soon gave up and did my regular, off-the-cuff, touchy feely, show-and-tell class. It is always fun to watch the expressions in my classes to see people understand all of the different ways Kreinik products can be used. At one point, I was asked to stop talking; a group of individuals had become so emotional over choices and possibilities that they needed time to absorb. These shop owners were so excited; it made the class even more special to me. To see someone realize the amazing creative possibilities of thread, reaching that level of understanding, bringing them “outside of the box” has always been my favorite point of conversation. Here are some pictures of shops in the Moscow vicinity and some of the historical sites about town. 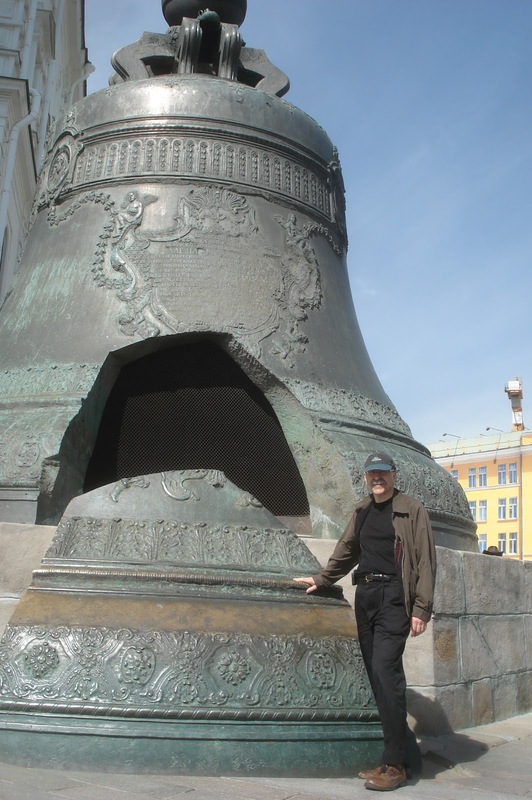 If you go to Moscow, make sure that you visit the Kremlin museum and see the crown jewels, the clothing worn by Peter the Great and Catherine, and the many albs and robes worn by the leaders of the Eastern Orthodox Church. One fascinating point I learned was that the Red Square name has nothing to do with the former Soviet State, but rather red in Russian means “beautiful”. My four days are now a memory, but I am looking forward to returning. Komas come to the rescue. This wooden spool serves as an extra "hand" to hold threads you are couching on the surface of your fabric or canvas. Originally used in Japanese embroidery, komas are used world-wide by stitchers of all ages and skill levels. Kreinik's Komas are made in Ohio, turned with West Virginia and Ohio wood. 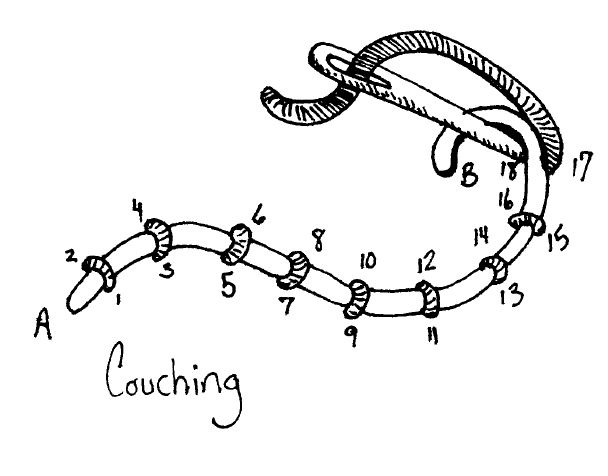 Couching is a surface embroidery technique in which you tack down a decorative thread with an invisible, coordinating, or contrasting thread. These tacking stitches can be either side to side, down the middle of your couched thread, or a decorative stitch such as Herringbone, Elongated Cross, etc. 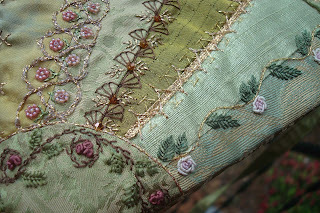 Couching is a traditional Japanese embroidery technique that has become popular in all needlework and crafts today, including counted thread, needlepoint, quilting, crazy quilting, surface embroidery, stumpwork, goldwork, crewel, and samplers. 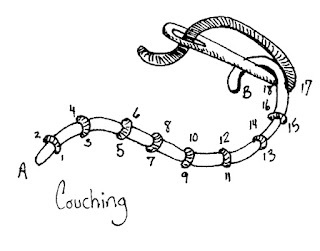 Komas are an easy way to hold — and direct — your couching threads as you stitch. Which threads can be couched? Couching is an excellent way to use threads that are too thick to pass through fabric or canvas, however you can couch any decorative thread: real metal, metallic, silk or ribbon. Kreinik threads you can couch include Japan #5, Japan #7, 1/8" Ribbon, 1/16" Ribbon, Facets, Petite Facets, Micro Ice Chenille, Heavy #32 Braid, Canvas #24 Braid, Medium #16 Braid, Silk Serica, and Kreinik Real Metal Threads. Kreinik threads that you use to couch these decorative threads include Silk Bella, Silk Mori, Silk Couching Thread, Japan #1, Cord, Blending Filament, Very Fine #4 Braid, Fine #8 Braid. For more information on these threads, visit www.kreinik.com. Why does the koma have square ends? They prevent the spools from rolling around or off your project as you stitch. 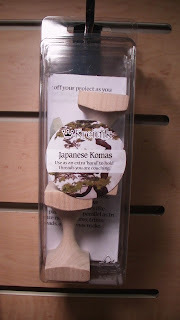 How do you use a koma? Wrap your decorative thread around the barrel of the koma, then set it on your needlework to unwind the thread as you couch. Move the koma as you work to keep your thread in proximity to your stitching area. This gives you greater control over your couching, and the wooden spools won't roll off as you work. Why are komas sold in pairs? Having two komas allows you to couch more than one thread at a time. This creates exciting embroidery effects and expands your creative options: imagine the dimension you can achieve by layering fibers like round Fine #8 Braid on top of flat 1/8” Ribbon, or placing them parallel as in two rows of smooth gold Japan #5. You can create new textures, trims, borders, and edgings by couching multiple threads, and komas make couching easier.